"Augustines" redirects here. For the American rock band, see Augustines (band). The term Augustinians, named after Augustine of Hippo (354–430), applies to two distinct types of Catholic religious orders, dating back to the first millennium but formally created in the 13th century, and some Anglican religious orders, created in the 19th century, though technically there is no "Order of St. Augustine" in Anglicanism. Within Anglicanism the Rule of St. Augustine is followed only by women, who form several different communities of Augustinian nuns in the Anglican Communion. Several mendicant Orders of friars, who lived a mixed religious life of contemplation and apostolic ministry and follow the Rule of St. Augustine, a brief document providing guidelines for living in a religious community. The largest and most familiar, originally known as the Hermits of St. Augustine (OESA; Ordo Eremitarum sancti Augustini) and also known as the Austin friars in England, is now simply referred to as the Order of St. Augustine (OSA). Two other Orders, the Order of Augustinian Recollects and the Discalced Augustinians, were once part of the Augustinian Order under a single Prior General. The Recollect friars, founded in 1588 as a reform movement of the Augustinian friars in Spain, became autonomous in 1612 with their first Prior General, Enrique de la Sagrada. The Discalced friars became an independent congregation with their own Prior General in 1592, and were raised to the status of a separate mendicant order in 1610. Various congregations of clerics known as Canons Regular who also follow the Rule of St. Augustine, embrace the evangelical counsels and lead a semi-monastic life, while remaining committed to pastoral care appropriate to their primary vocation as priests. They generally form one large community which might serve parishes in the vicinity, and are organized into autonomous congregations, which normally are distinct by region. In a religious community, "charism" is the particular contribution that each religious order, congregation or family and its individual members embody. The teaching and writing of Augustine, the Augustinian Rule, and the lives and experiences of Augustinians over sixteen centuries help define the ethos (principles) and special charism of the order. As well as telling his disciples to be "of one mind and heart on the way towards God", Augustine of Hippo taught that "Nothing conquers except truth and the victory of truth is love" (Victoria veritatis est caritas), and the pursuit of truth through learning is key to the Augustinian ethos, balanced by the injunction to behave with love towards one another. It does not unduly single out the exceptional, especially favour the gifted, nor exclude the poor or marginalised. Love is not earned through human merit, but received and given freely by God's free gift of grace, totally undeserved yet generously given. These same imperatives of affection and fairness have driven the order in its international missionary outreach. This balanced pursuit of love and learning has energised the various branches of the order into building communities founded on mutual affection and intellectual advancement. The Augustinian ideal is inclusive. Augustine spoke passionately of God's "beauty so ancient and so new", and his fascination with beauty extended to music. He taught that "whoever sings prays twice" (Qui cantat, bis orat) and music is also a key part of the Augustinian ethos. Contemporary Augustinian musical foundations include the famous Augustinerkirche in Vienna, where orchestral masses by Mozart and Schubert are performed every week, as well as the boys' choir at Sankt Florian in Austria, a school conducted by Augustinian canons, a choir now over 1,000 years old. Augustinians have also produced a formidable body of scholarly works. The Canons Regular follow the more ancient form of religious life which developed toward the end of the first millennium and thus predates the founding of the friars. They represent a clerical adaptation of monastic life, as it grew out of an attempt to organize communities of clerics to a more dedicated way of life, as St. Augustine himself had done. Historically it paralleled the lay movement of monasticism or the eremetical life from which the friars were later to develop. In their tradition, the canons added the commitment of religious vows to their primary vocation of pastoral care. As the canons became independent of the diocesan structures, they came to form their own monastic communities. The official name of the Order is the Canons Regular of St. Augustine (CRSA). Like the Order of St. Benedict, it is not one legal body, but a union of various independent congregations. Though they also follow the Rule of St. Augustine, they differ from the friars in not committing themselves to corporate poverty, which is a defining element of the mendicant orders. Unlike the friars and like monks, the canons are generally organized as one large community to which they are attached for life with a vow of stability. Their houses are given the title of an abbey, from which the canons then tend to various surrounding towns and villages for spiritual services. The religious superior of their major houses is titled an abbot. Smaller communities are headed by a prior or provost. The distinctive habit of canon regulars is the rochet, worn over a cassock or tunic, which is indicative of their clerical origins. This has evolved in various ways among different congregations, from wearing the full rochet to the wearing of a white tunic and scapular. The Austrian congregation, as an example, wears a sarozium, a narrow band of white cloth—a vestige of the scapular—which hangs down both front and back over a cassock for their weekday wear. For more solemn occasions, they wear the rochet under a violet mozzetta. Communities of canons served the poor and the sick throughout Europe, through both nursing and education. They include the canons of the Great St. Bernard Hospice at Great St. Bernard Pass in the Alps on the border of Switzerland, where they have served travelers since the mid-11th century. This community is the one which developed the familiar breed of St. Bernard to assist the canons in their ability to find travelers buried by avalanches. The Congregation of the Great St. Bernard is a member of the Confederation of the Canons Regular of St. Augustine. The Canons Regular of the New Jerusalem are a newly founded Tridentine rite congregation. Martin Luther (1483–1546), in the habit of the Augustinian Order. Luther was an Augustinian friar from 1505 until his excommunication in 1520. Luther would later renounce his religious vows and marry Katharina von Bora in 1525.
a) friars, whether professed or novices, who are members of the various Circumscriptions of the Order (meaning a Province, Vicariate, or Delegation). b) the contemplative nuns belonging to the monasteries of the Order. c) the members of the Augustinian Secular Fraternities, legitimately established by the Prior General. In addition to these three branches, the Augustinian family also includes other groups: a) religious institutes, both male and female, formally aggregated to the Order by a decree of the Prior General (this would include the Augustinians of the Assumption, the Sisters of St. Rita, etc. ); b) other groups of lay Augustinians; c) lay faithful affiliated to the Order. The Augustinian, or Austin, friars (OSA), are a mendicant order. As consecrated religious, they pray the Liturgy of the Hours throughout the day. This Latin Rite Order, while a contemplative Order, differs from traditional monastic Orders in three ways. 1) They do not take vows of stability, meaning that they can live in one house (called a friary or sometimes a monastery) typically for several years before being moved into a different community of the Order. 2) They are engaged in apostolic activity, such as mission work, education, prison ministries, etc. The Order is under the supervision of a Prior General in Rome, and as an international Order they are divided into various Provinces throughout the world, with each Province being led by a Prior Provincial. (3) As an Order, they have a special commitment to corporate poverty as opposed to simply the poverty professed by the individual friar. While this is not currently legislated as it was in the origins of the Order, this is to be a distinguishing mark of their lives as a community. As consecrated religious, Augustinians profess the evangelical counsels of chastity, poverty, and obedience. They follow the Rule of St. Augustine, written sometime between 397 and 403 for a monastic community Augustine founded in Hippo (modern day Algeria), and which takes as its inspiration the early Christian community described in the Acts of the Apostles, particularly Acts 4:32: "The community of believers was of one heart and mind, and no one claimed that any of his possessions was his own, but they had everything in common." (NAB). By decree of the Holy See, the Augustinian Order is granted exempt status, which places it under the direct dependence on the Pope, meaning that bishops have no jurisdiction with regards to the internal affairs of the Order. The Augustinian friars originated after the older Canons Regular. The friars represented part of the mendicant movement of the 13th century, a new form of religious life which sought to bring the religious ideals of monastic life into an urban setting which allowed the religious to serve the needs of the People of God in an apostolic capacity. At this time a number of eremitical groups lived in such diverse places as Tuscany, Latium, Umbria, Liguria, England, Switzerland, Germany, and perhaps France. In 1243 the Tuscan hermits petitioned Pope Innocent IV to unite them all as one group. On 16 December 1243 Innocent IV issued the bull Incumbit Nobis, an essentially pastoral letter which, despite its brevity, basically served as the magna carta initiating the foundation of the Order as it is known today. This papal bull exhorted these hermits to adopt "the Rule and way of life of the Blessed Augustine, to profess this Augustinian manner of life in a way that they themselves would decide with regards to their specific charism and apostolate, and to elect a Prior General. The bull also appointed Cardinal Riccardo Annibaldi [it] as their supervisor and legal guide. The importance of this man in the foundation of the Order cannot be overstated. As decreed by the Bull Praesentium Vobis, the Tuscan hermits came together for a general chapter in March 1244, a chapter presided over by Cardinal Annibaldi. At this chapter the Order formally adopted the Rule of St. Augustine and determined to follow the Roman office with the Cistercian psalter, and to hold triennial elections of the Prior General. The first Prior General was Friar Matthew, followed by Adjutus and Philip. In the Papal Bull Pia desideria, issued on 31 March 1244, Pope Innocent IV formally approved the foundation of the Order. This historical union has subsequently been termed the Grand Union of 1256. At this Chapter Lanfranc Settala, the leader of the Bonites, was elected Prior General. The 12-year-old religious Order of friars now consisted of 100 or more houses. On 22 August 1256 the Italian Williamites, unhappy with the arrangement of the Grand Union, left the Order and adopted the Rule of St. Benedict. It is certain that in its modern state the Order is principally founded on spiritual works, those that pertain to the contemplative life. These are as follows: the singing of the divine office; the service of the altar; prayer; psalm singing; devotion to reading or study of sacred scripture; teaching and preaching the word of God; hearing confessions of the faithful; bringing about the salvation of souls by word and example. The Augustinians count among their number over a dozen saints and numerous members declared blessed by the Church. The Augustinian Hermits, while following the rule known as that of St. Augustine, are also subject to the Constitutions, first drawn up by Augustinus Novellus (d. 1309), Prior General of the Order from 1298 to 1300, and by Clement of Osimo. A revision was made at Rome in 1895. The Constitutions were revised again and published at Rome in 1895, with additions in 1901 and 1907. Today, the Order follows the Constitutions approved in the Ordinary General Chapter of 2007. The government of the order is as follows: At the head is the Prior General, elected every six years by the General Chapter. The Prior General is aided by six assistants and a secretary, also elected by the General Chapter. These form the Curia Generalitia. Each province is governed by a Prior Provincial, each commissariat by a Commissary General, each of the two congregations by a Vicar General, and every monastery by a Prior (only the Czech monastery of Alt-Brunn in Moravia is under an abbot) and every college by a Rector. The members of the Order number both priests and lay brothers. The Augustinians, like most religious orders, have a Cardinal Protector. The choir and outdoor dress of the friars is a tunic of black woolen material, with long, wide sleeves, a black leather girdle, and a large shoulder cape to which is attached a long, pointed hood reaching to the girdle . The indoor dress consists of a black tunic and scapular, over which the shoulder cape is worn. In many monasteries. white was formerly the color worn in areas where there were no Dominicans. In hot climates Augustinians tend to wear white habits as they are easily distinguishable with the Dominicans (i.e. without long scapular, rosary, etc.). The Augustinians follow the rule of St. Augustine which is divided into 8 chapters (purpose and basis of common life, prayer, moderation and self-denial, safeguarding chastity and fraternal correction, the care of community goods and treatment of sick, asking for pardon and forgiving others, governance and obedience, and observance of the rule). The Augustinians also use the charism or "gift from the Holy Spirit" to guide the communal life. Like the rule it has three parts: spirituality (searching for God – during prayer Augustine found himself, God, and his brothers); fraternity (community life – the Augustinians encounter God through fraternity; peace and harmony among the brothers is a sign from the Holy Spirit that is dwelling within the Augustinians and constitutes a testimony to the whole church, "Be of one mind and heart"); and ministry (service to the church – the Augustinians make themselves available to the church to announce and live the reign of God). The Discalced Augustinians were formed in 1588 in Italy as a reform movement of the Order and have their own constitutions, differing from those of the other Augustinians. Their fasts are more rigorous and their other ascetic practices stricter. They wear sandals, not shoes, a practice which accounts for their name (scalzo or "barefoot"). In an effort to preserve their roots in the hermit life, the Discalced Augustinians practice strict silence and have in every province a house dedicated to recollection situated in some retired place, to which friars striving after greater perfection can retire in order to practice severe penance, living only on water, bread, fruits, olive oil and wine. The Augustinian Recollects developed in Spain in 1592 with the same goal. Currently, though, they are primarily found serving in pastoral care. The North American foundation of the Order took place in 1796, when Irish friars arrived in Philadelphia. Michael Hurley was the first American to join the Order, the following year. The friars established schools throughout the Americas, including the two Augustinian institutions of higher learning in the United States: Villanova University in Pennsylvania and Merrimack College in Massachusetts. The following high schools were also established: Malvern Preparatory School in Pennsylvania (1842); Augustinian Academy, Staten Island, NY (1899 – closed in 1969). St. Rita of Cascia High School in Chicago (1909); St. Augustine High School in San Diego, California (1922); Villanova Preparatory School in Ojai, California (1925); Cascia Hall Preparatory School in Tulsa, Oklahoma (1926); Monsignor Bonner High School in Drexel Hill, Pennsylvania (1953); St. Augustine College Preparatory School in South Jersey (1959); Austin Preparatory School in Reading, Massachusetts (1961); Augustinian Academy, St. Louis, Missouri (1961, closed 1972); Providence Catholic High School, Diocese of Joliet in Illinois (1962); St. Thomas of Villanova College in King City, Ontario (1999); Austin Catholic High School, Diocese of Detroit in Michigan (2011). The Hieronymites, the Sisters of St. Rita, the Ursulines, the Canonesses of St. Augustine of the Mercy of Jesus, Augustinians of the Assumption (which includes a Byzantine Rite province), the Alexian Brothers (located in the US, Europe, England, Ireland the Philippines and India), the Brothers of the Assumption (in the Congo), the Sisters of Our Lady of Consolation and San Guillermo Parish Church (which was buried half it's 12-m height on September 3, 1994, due to the lahar slopes of Mount Pinatubo, Philippines), the Congregation of Our Lady of the Missions, the Sisters of Charity of the Incarnate Word (who established the University of the Incarnate Word in Texas), and the Sisters of St. Joan of Arc (in Quebec, United States, and Rome).. The lay societies are voluntary groups, generally made up of people who are either married or single and have sympathy with, and interest in, the Augustinian approach to life. These lay people do not take monastic vows, but offer support to the work of the Augustinian Order in voluntary work, gifts of money and goods, and of study and promotion of St. Augustine and Augustinian teaching. The primary among these are the Third Orders associated with the various branches of the mendicant Orders. These are the Augustinian Lay Community and the Secular Augustinian Recollects. They make a formal and public commitment as laity to follow as best as possible the life and charism of the Order. Other associations which support the spirit and work of the friars and Sisters include: the Brotherhood of the Virgin Mary of the Belt in Italy, the Friends of Augustine in the Philippines, and the Augustinian Friends in Australia. ^ Jean Besse, "Rule of St. Augustine." THE CATHOLIC ENCYCLOPEDIA. Vol. 2. New York: Robert Appleton Company, 1907. ^ Also see: "Rule of St. Augustine," Richard Mc Brien. The HarperCollins Encyclopedia of Catholicism (1995). p.112. ^ Augustine of Hippo Sermons 358,1 "Victoria veritatis est caritas"
^ "Collection Items: Contributions from Augustinian Theologians and Scholars". digital.library.villanova.edu. Retrieved 2017-12-12. ^ "CATHOLIC ENCYCLOPEDIA: Canons and Canonesses Regular". www.newadvent.org. Retrieved 2017-12-12. ^ "Site is Down". newsite.augustiniancanons.org. Retrieved 2017-12-12. ^ "Augustinians - Order of Saint Augustine". augustinians.net. Retrieved 2017-12-12. ^ "Charism - Order of Saint Augustine". augustinians.net. Retrieved 2017-12-12. 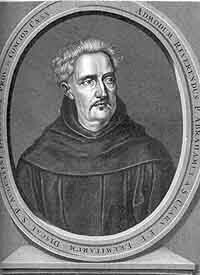 ^ See BONIFATIUS PP. VIII, Sacer Ordo vester, 21.I.1298; Inter sollicitudines nostras, 16.I.1302, en Bullarium, 44–45. 50–52. CLEMENS PP. VI, Ad fructus uberes, 19.VIII.1347, Ibid., 64–65. Lumen Gentium 45. ^ a b c "CATHOLIC ENCYCLOPEDIA: Hermits of St. Augustine". www.newadvent.org. Retrieved 2017-12-12. ^ "Augustinian Saints, Blesseds, and Feast Days". Midwest Augustinians. Retrieved 2017-12-12. ^ "Roots of Augustinian Spirituality". Midwest Augustinians. Retrieved 2017-12-12. ^ Taylor, Thomas. "Our History". Midwest Augustinians. Province of Our Mother of Good Counsel. Retrieved 19 December 2014. ^ Nicholas, Friar Shane. "Our History". www.aihmfriars.net. Retrieved 2017-12-12. ^ "The Society of St. Augustine". The Society of St. Augustine. Retrieved 2017-12-12. ^ "Soeurs - Augustine de la miséricorde de Jésus". www.augustines.org. Retrieved 2017-12-12. ^ The Rule of Saint Augustine and the Constitutions of the Order of the Incarnate Word and Blessed Sacrament, New York: Schwartz, Kirwin, and Fauss, 1893, pp. 33–35. The Augustinians (1244–1994): Our History in Pictures. Pubblicazioni Agostiniane, Roma, Italy. Canning; R. (1984). The Rule of St Augustine. Darton, Longman and Todd. Ebsworth, Rev. Walter (1973). Pioneer Catholic Victoria. Polding Press. ISBN 0-85884-096-0. Hackett; Michael Benedict (2002). A Presence in the Age of Turmoil: English, Irish and Scottish Augustinians in the Reformation and Counter-Reformation. Augustinian Historical Institute, Villanova University, Pennsylvania. ISBN 1-889542-27-X. Hickey, P. J. (1981). A History of the Catholic Church in Northern Nigeria. Augustinian publications in Nigeria, Jos, Plateau State, Nigeria. Orbis Augustinianus sive conventuum O. Erem. S. A. chorographica et topographica descriptio Augustino Lubin, Paris, 1659, 1671, 1672. Règle de S. Augustin pour les réligieuses de son ordre; et Constitutions de la Congregation des Religieuses du Verbe-Incarne et du Saint-Sacrament (Lyon: Chez Pierre Guillimin, 1662), pp. 28–29. Cf. later edition published at Lyon (Chez Briday, Libraire,1962), pp. 22–24. English edition, The Rule of Saint Augustine and the Constitutions of the Order of the Incarnate Word and Blessed Sacrament (New York: Schwartz, Kirwin, and Fauss, 1893), pp. 33–35. Zumkeller, Adolar (1986). Augustine's ideal of Religious life. Fordham University Press, New York. Zumkeller, Adolar (1987). Augustine's Rule. Augustinian Press, Villanova, Pennsylvania. Wikimedia Commons has media related to Augustinians.